Benjamin was greatly admired for his serious and dedicated approach to painting, his investment in those he chose to mentor and for being a truly kind soul. Karl Benjamin in his studio, circa 1984. Courtesy of Louis Stern Fine Arts, reproduced by permission. 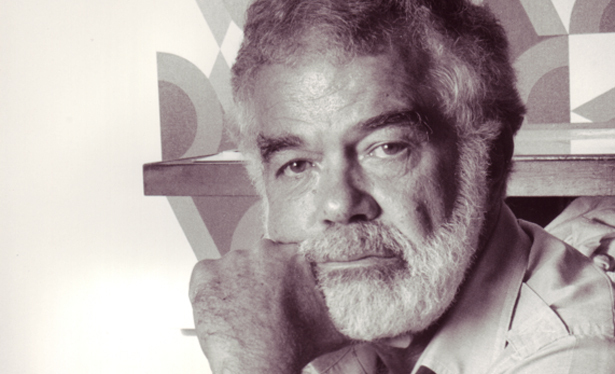 The Nation was saddened to hear of the recent death of California artist Karl Benjamin. His daughter Beth kindly wrote, wanting us to know that her father was a "long, long, long time supporter of The Nation and other progressive causes," and that "The Nation was one of the last things he was able to read as his eyes got worse." A California resident all his adult life who taught at Pomona College and before that at Southern California public schools, Benjamin was a painter of dazzling geometric abstractions who established a national reputation in 1959 as one of four Los Angeles-based Abstract Classicists and then created an acclaimed body of work that celebrates the glories of color in all its hues and variations. In a sweeping obituary in the Los Angeles Times, art critic Suzanne Muchnic explained that "working with a full palette and a vocabulary of stripes, squares, triangles, circles, rings and irregular shapes, he created tightly balanced compositions that seem to shimmer, vibrate or explode in space." Benjamin’s work then fell out of fashion in the 1970s and ’80s, before making a dramatic comeback when his paintings suddenly looked fresh and smart to a new, younger generations of artists, critics and curators. "In an art world that all too often brims with attitude, Karl was a man greatly admired for his serious and dedicated approach to painting, his investment in those he chose to mentor and for being a truly kind soul."